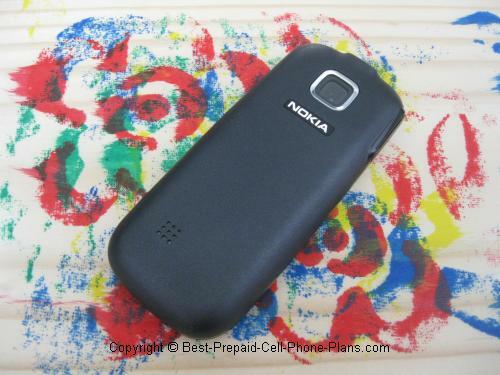 The GoPhone Nokia 2330 provided an inexpensive entry to AT&T's prepaid cell phone plans. For less than eight dollars for the phone (when available), you could test out their system. If you liked it, you coud either keep the phone or move up to a fancier one. This phone is now discontinued, but I've kept the review below for reference. 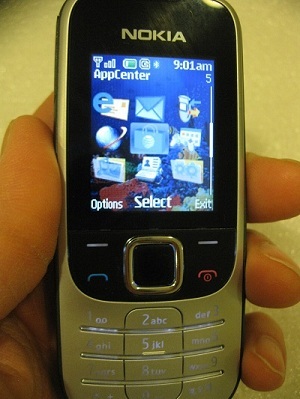 It is a small handset, with small keys and a small screen. But even though the 2330 is a basic candy-bar style phone, it still has a couple of nice extras such as a camera, Bluetooth, instant messaging and even mobile email capability. In fact I was pleasantly surprised with mine once I activated it. The VGA camera on this phone gives you 640 x 480 resolution photos. These are traditionally the type you can exchange via picture messages and then email or just keep on your phone to look at. Since the pics are small, they don’t take up too much space, which is a good thing as the phones has 8MB internal memory for storing pictures and messages. The camera does have a few useful features such as “night mode”. The Gophone Nokia 2330 comes with a basic image editor. You can also insert captions into your photos. These captions can be in different fonts and colors, and you can place and rotate the caption as well. However, when you save the photo, it gets saved as a tiny photo (86 x 115 pixels) just large enough to fill the cell phone screen. You can also take small (128 x 96) videos. Basically good for Hi, Mom-type stuff. The video is in the form of a .3gp file which can be played with the Quicktime player once you transfer it to your PC (via Bluetooth, of course). When you play back the video on the phone, the audio sounds awful because of the phone’s speaker. However, when you hear it on the PC, you’ll be pleasantly surprised to hear that it sounds pretty good. Yes, you can chat via instant messaging on the AOL, Yahoo and MSN networks on your Nokia. I didn’t personally try it, but I assume it works fine. IM messaging costs 1 cent per 5 kilobytes on all the GoPhone plans except the $50 a month unlimited plan which has unlimited data. You can also check you messages via mobile email. You can access these major providers: Yahoo Mail, AOL, Hotmail, AT&T Yahoo, and BellSouth. You can also access what they call “other providers” which are Comcast, Earthlink, Juno, Mindspring, and NetZero. The one big provider that’s missing here is Google Gmail (though you can use the web browser). The above data charges will apply for email as well. You can send text and picture messages with on your 2330. For text messages there are a few message templates to make replies easier. The funniest one is, “I love you, too.” I suppose you can delete the “too” if you’re sending the initial text. Still, I like the recognition when replying to an “I love you” message, speed is of the essence! You can also send quick audio clip using the Nokia Audio Xpress. Basically, when you go into the message menu, you have to option to choose Audio, record a quick message and then send it. The audio message can be up to 3 minutes and six seconds long. Once you finish recording, the audio is automatically attached to a message, and you you just have to fill in the "To:" field. You also have the option to save your recording if you want. The process is indeed pretty quick, hence the Xpress name. You can use Bluetooth to pair the Nokia 2330 up with a headset or you can transfer your files (photos, videos etc.) to a Bluetooth-equipped Mac or PC. I used it to transfer the photos and videos I took. There is a 500-entry phone book, along with a calendar, alarm clock and personal organizer. I tried out the alarm, and it seems okay. Note that on my refurbished unit, the alarm was already set on at 9 am! Don't know if that's the factory setting or if 9 am was the wake-up time of the previous owner - nice if you can get it. You can these type of events to your calendar: Reminder, Meeting, Call, Birthday, Anniversary, and Memo. You can make notes and add them to your to-do list. There are the standard calculator, timer and stopwatch. The calculator is nice for two reasons. One is that the keys go silent. You don't hear the beep, beep, beep, when you're in the store trying to figure out if something is a good deal or not. The good things about the calculator is that it has the scientific functions and also has a separate loan calculator - great when you're out on a major purchase like buying a car or room furniture or anything that you will pay on installment. The Gophone Nokia 2330 comes with a few games installed as well as the ability to buy games from AT&T. The included games on my phone were Diner Dash 2, JewelQuest 2, Ms. Pac-Man, Platinum Solitaire 2, and Tetris. However, when you start to play the game, the phone says that AT&T network access required to validate subscription, and additional charges may apply. After saying OK, I found out that all the installed games were actually demo versions, and that you had to buy the full game from AT&T. Pac-Man, for example costs either $2.99 per month or you can buy it outright for $6.99 (taxes may apply). While accessing the network, I got charged $0.01 (1 cent) per kilobyte to validate my subscription. I called AT&T customer support, and a rep named Oscar confirmed I only have demo versions o my Gophone Nokia 2330, and that I would have to purchase the game either from the phone or online. Online was better because you don’t spend data checking out the games to see which one you want. Once you buy the game outright, you don’t incur data charges unless it’s an online player game. He was also kind enough to refund my one cent. One cent may not seem like a lot, but when you're on the $2 a day plan, it makes a difference whether you have $2 or $1.99 in your account. 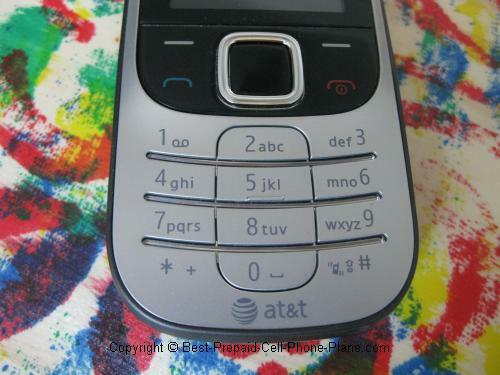 The phone comes with about ten ringtones installed. There is an ATT mp3 ringtone, and the rest are .aac (better sound quality) ringtones. You can buy additional ringtones and also have answerback tones as well for your friends. You can also just transfer a compatible sound file to your Gophone and assign it as a ringtone. The Gophone Nokia 2330 comes with four themes installed: Light, Matt Black, Reef, and Tree, the last of which is installed as the default theme. The Tree theme looks nice, however, one drawback is that it’s difficult to see what item you have selected in the menu. For that reason, you may want use one of the other three default themes or download your own .nth (Nokia theme) file. The phone actually has a music player capable of playing full mp3 songs. Now, this fact isn’t really advertised because there isn’t any way to actually store more than one or two songs because the phone has just 8MB of memory. For example, as a test, I transferred Justin Bieber’s One Less Lonely Girl, a 3.5 MB MP3 file, to the phone. After the file is transferred, it appears as a tone, but you can play it in the “music player”. After taking one photo, one small video, and transferring the one song, the phone was almost out of memory. The GoPhone Nokia 2330 weighs just 2.8 ounces and measures just 4.2 x 1.8 x 0.5 inches. With the small size also comes a small keyboard and 1.8 inch screen (128 x 160 pixels). You may find the small keyboard takes a little getting used to. If you prefer a larger keypad, you may have to move up to a larger phone. Judging from some of the comments, you can try increasing the screen brightness and speaker volume. The 1020 mAh battery is supposed to provide 3.5 hours of talk time and 14 days of standby. Some users have complained about the battery draining too quickly. You can try shutting off Bluetooth if you’re not using it to extend your battery life. You can also expect the battery to drain more quickly if you use features like instant chat a lot. Just charge it every night and you should be okay. Get the GoPhone Nokia 2330? 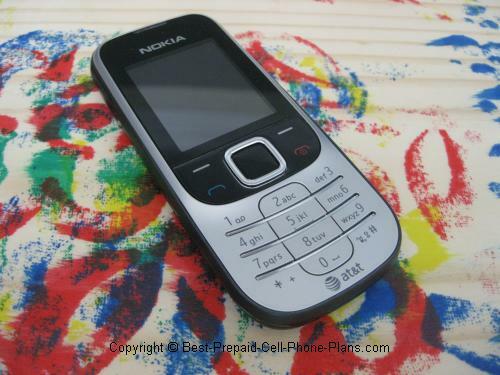 You can get the GoPhone Nokia 2330 and save money on AT&T's prepaid plan. If you like the plan, you can stay with it and keep the phone or get something fancier like a touch screen phone or one with a QWERTY keyboard. Tell us about your experience with this Nokia phone!